Hurricane Michael became the most intense hurricane on record to strike the Florida Panhandle when it made landfall at 1:00 p.m. CDT on Wednesday. It will also be among the most intense hurricanes to ever have hit the U.S. At landfall, the storm’s 155 mph peak winds ranked fourth highest on record for a hurricane hitting the continental U.S., and the pressure was ranked as the third lowest (the lower the pressure, the stronger the storm), even below what was recorded during Hurricane Andrew in 1992. This is truly a historic event. As I mentioned yesterday, this storm was only a marginal threat six days ago when it first appeared on some of the long-range model guidance, which illustrates that the scientific community has a lot of work to do in terms of intensity forecasts. In fact, Michael’s rapid deepening, which is defined as less than or equal to a pressure drop of 42 mb in 24 hours, is rare. Only 23 hurricanes in the last 38 years have done this, and Michael was the only hurricane to have this occur right at landfall. Hurricane Michael made landfall in Mexico Beach, FL, about 20 miles southeast of Panama City, as a high-end Category 4 hurricane, and I would not be surprised if it was upgraded to a Category 5 when the National Hurricane Center (NHC) conducts its final review of the data. As the storm crashed ashore, winds gusted to as high as 129 mph along the coast from Panama City to Port St. Joe. The highest storm surge reading that has been observed so far was an inundated level of just over 8.57 feet in Apalachicola, FL – which is the 3rd highest on a new record. Other areas likely recorded their record highest. Much of the news coverage during landfall was in Panama City Beach, FL. However, the impact at this location was a picnic compared to what occurred just miles east and southeast down the coast where the eye of Michael made landfall. The heaviest damage appears to be in the towns of Callaway, Parker, Springfield, Mexico Beach, Port St. Joe and southeast Panama City, FL. This would suggest that the radius of maximum winds was relatively narrow at landfall (22 miles) and, thankfully, just inland from landfall, Michael tracked over a large sparsely populated area of mostly agricultural land and forest. However, that does not mean that some of the smaller towns or rural households did not see damage. For example, In Donaldsville, GA, which is 82 miles inland from Panama City, FL there was a recorded wind gust of 115 mph that still needs to be verified, but at least a 79 mph gust was reported . Blountstown, FL seems to have been hit particularly hard which is about 40 miles inland. The weather station in Albany, GA recorded a wind gust of 74 mph just before transmission failure occurred. In fact, to get an idea of where the worst of the damage might be, one just has to look at the lack of surface weather observations due to an absence of site reporting and power outages. BMS iVision allows clients to run risks to better understand various impacts from Michael. This is the newest 3 sec wind speed gust in MPH from Verisk Weather Solutions. There will be some adjustment to this as Verisk Weather Solutions will incorporate surface observations over the next few days for intensity. There are several reports of weather station anemometers breaking in the high winds, which is why it is possible that wind speeds of greater than 129 mph may have occurred near the landfall location. Given the data that has already been collected, it is plausible that Hurricane Michael will be a design-level event, especially at the immediate coastline and barrier islands along the Florida Panhandle. Based on an examination of the catastrophe modeling stochastic events that closely match Michael’s landfall location and intensity, insurance industry losses should be in the single-digit billions of dollars. But, as we have seen with past events in Florida, there can be some loss creep, so how high remains uncertain. The big unknown in the modeling at this point is how much property damage occurred in the rural communities inland as Michael tracked into Georgia. A good gauge of Hurricane Michael’s severity is to get firsthand accounts from the storm chasers who travel the world into the heart of the strongest hurricanes, typhoons and cyclones. Their observations really tell the story of what the hardest hit areas are dealing with in the wake of Michael. Hurricane Michael is far from over. Heavy rain and strong winds are still forecasted to sweep through the Carolinas today before exiting the Mid-Atlantic coast Friday morning. Currently 35 miles south southeast of Charlotte, NC, tornado risk is now the biggest threat with local wind gusts capable of bringing down tree limbs. As we look into next week, we begin to move past this early October period of enhanced Atlantic Basin activity. We can’t entirely rule out new named storm development next week, but, the very good news is that the risk for tropical storms and hurricanes in the Atlantic Ocean is expected to decrease sharply over the coming weeks as a hybrid El Niño winter pattern begins to take hold. Based on the National Hurricane Center’s (NHC) 5:00 a.m. advisory, Hurricane Michael’s pressure had fallen 36 millibars in 25 hours and the wind speed had increased 46 mph over the same timeframe. Having moved into an ideal environment for maximum intensity, with little wind shear, warm water, and a moist air mass with little dry air intrusion, such strengthening was expected, but the extent is still unknown. Michael is currently a Category 4 hurricane with a central pressure of 923, and a maximum wind speed of 150. For a hurricane, Michael is moving fairly quickly to the northeast at 14 mph and is currently 60 miles South Southwest from Panama City, FL. Given that the hurricane is a few hours from making landfall just southeast of Panama City, FL, the question is, how much more strengthening may occur before landfall? There is a chance that an eyewall replacement cycle could result in a similar or slightly lower intensity, but if an eyewall replacement cycle occurs immediately before landfall, there is a chance that Michael could be an even stronger storm with a larger radius of maximum wind. Michael arriving as a Category 4 hurricane puts it in a rare group of only four historical Category 4 hurricanes to make landfall during the month of October (Unnamed, Louisiana, Oct. 2, 1893, Unnamed, Georgia, Oct. 2, 1898, King, Florida, Oct. 18, 1950 and Hazel, Carolinas, Oct. 15, 1954). In total, only 28 U.S. landfalls of Category 4-strength storms have occurred since 1850, and there has never been a Category 4 or 5 hurricane to make landfall in the Florida Panhandle. With Michael’s impending landfall as a Category 4 storm, it would be the fourth Category 4 hurricane in just 15 months to hit the U.S. The previous record for the shortest timespan of four Category 4 U.S. landfalls was 1947 – 1950. Needless to say, the long period without a major hurricane making U.S. landfall is starting to correct itself in a big way. Given the change in the overall intensity forecast, most of the catastrophe model guidance issued yesterday will need to be adjusted upward to account for the stronger storm at landfall, as most guidance issued did not contemplate this scenario. However, there are plenty of stochastic events for comparison, and there should not be an issue of limited matching, like some of the more recent U.S. landfalling hurricanes. I have already touched on the likelihood of massive tree loss in the last few updates, but clearly the increased intensity at landfall confirms that treefall will lead to larger insured losses and will lengthen expected power outages. Unfortunately, this scenario is not handled well in the catastrophe models. Michael’s strength is now at the upper end of what building codes can handle and, while Florida has the best building codes in the country, most structures were built before these codes were enacted, and retrofits have been limited. Using Verisk Weather Solutions forecasted wind swath allows BMS clients to better understand wind impact to specific risks. Currently, the wind swath suggests a radius of maximum winds to be about 26 miles wide, which is fairly tight for a hurricane. Shortly after landfall, frictional effects rapidly weaken the maximum wind speeds inland. In addition, Tallahassee should be spared any hurricane-force winds, which is a bit of better news, as insured loss will be limited in this large metro area. But, some damage and power outages could still occur. BMS iVision allows clients to run risks to better understand various impacts from Michael. This is the newest 3 sec wind speed gust in MPH from Verisk Weather Solutions. There will be some adjustment to this swath over the next few days as Verisk Weather Solutions incorporates surface observations. There is no doubt that record storm surge will be recorded, as storm surge values of four feet are already showing up in Apalachicola, FL. The next high tide will be just after 6:00 p.m., which should be a few hours after landfall, so, fortunately, Michael is not coming ashore during high tide. It appears that, like some of the other devastating Category 4 hurricanes, Michael will also target an area of relatively lower population. However, Panama City has a large amount of exposure and will be the main driver of loss and, like most other U.S. coastal cities, has experienced a tremendous amount of growth over the last 30 years. Most of the other targeted areas inland remain very rural, however. The NHC Cone of Uncertainty overlayed with Census block Household data showing many block areas have less than 600 households. Here we take the details of the iVision wind swath with the aerial imagery applied to the base map. The radius of maximum winds is forecasted to be about 22 miles at landfall. The strongest winds are forecasted to impact the first 14 miles of coastal exposure as indicated by the first short green line, with the red line indicating areas of higher development. Most of the strongest winds will be over Forest or Agriculture land. Click on image for more detail. The building codes inland are not as strong as in the coastal areas, such as Panama City, Fl. The older age of the homes inland, coupled with the potential for tree fall, make for uncertain loss estimates. Hurricane Irma illustrated that there are clearly loss creep issues occurring across the state, which will also add to the overall uncertainty around potential losses to the insurance industry. An early look at some of the catastrophe model guidance suggests a mid to high single-digit billion dollar loss event, but the impacts to Panama City need to be watched closely. Remember to never judge a hurricane season until it’s over and in the books. This recent uptick in activity is putting the current season back into the “above normal” category, as we now have the development of Tropical Storm Nadine in the East Atlantic, along with Leslie returning to hurricane status on its 19th day of spinning up ACE in the middle of the Atlantic. And, of course, to close out the story, we have a surprise Category 4 hurricane in the Gulf of Mexico. I think that the scientific community needs to provide more accurate seasonal forecasts and move away from the numbers game, which often leads to false impressions of a season. More attention needs to be focused instead on landfall activity. It is no longer acceptable to believe, as the old insurance industry saying goes, that it “only takes one,” since this year there has been two. Hopefully, I made this message clear at the beginning of the season. The good news is that this may be the end game for this season in terms of U.S. landfalls, as a less favorable pattern for new development takes hold across the Atlantic later next week. Just two years ago we were talking about Hurricane Hermine breaking the 11-year hurricane drought in Florida. With all of the recent U.S. hurricane activity, it’s easy to forget that this drought even occurred, but let’s remember that there are large gaps of the U.S. coastline that have not experienced a major hurricane in a long time. The Panhandle of Florida is one of them, as it has not seen a major hurricane in well over 10 years. For context, iPhones had not yet been released when Hurricane Dennis impacted the Panhandle in 2005. Over this time period, there has also been rapid growth of coastal communities around Destin and Panama City, FL. There are certainly new residents in this area who have never experienced a major hurricane. There is good news that Hurricane Michael did not rapidly intensify overnight, and it only showed a small increase in intensity. A fully concentric eyewall has yet to develop, with dry air and wind shear being the likely cause of the lack of rapid intensification overnight. There are some signs that significant strengthening has already began today, as some lightning and deeper convection seem to be initiating eyewall development, and the overall storm seems to be consolidating. Michael is located 360 miles south of Panama City, FL. The current wind speed is 110 mph which is already an increase of 20 mph from the 4 AM NHC Advisory and barometric pressure is 965 mb. While there is still some uncertainty around Michael’s intensity at the time of landfall, the model track guidance has been accurate since this weekend. The projected path has been targeting an area between Destin and Port St. Joe, FL, with a likely probability (60%) of hurricane-force winds impacting the capital city of Tallahassee. In the BMS Tropical Update yesterday, I touched on several factors that could lead to Michael’s strengthening and also some that may limit it, such as the lack of a Gulf of Mexico Loop Current and just slightly cooler Sea Surface Temperatures (SST) that Michael will encounter along its track northward. A lot of the intensity questions at landfall will depend on the circumstances over the next 24 hours and whether Michael can intensify enough before making landfall tomorrow afternoon. Currently it seem to be progressing to major hurricane status later today. Above is an ensemble of intensity forecasts. There is agreement that Hurricane Michael will likely be at least a Category 2 storm at landfall, with some of the more reliable hurricane-specific intensity models suggesting that strengthening will occur right up until landfall, which is an important point. Some models suggest an even stronger storm which needs to be watched. Currently, the NHC forecast is still suggesting the wind speed at the time of landfall is expected to be 126 mph, with higher 3 second gusts possible. The overall size of the storm, which is sometimes referred to as the RMAX, is a bit unknown at this time, as eye wall replacement cyclones and the overall intensity of the storm will determine this over the next 24 hours. The forward motion of the storm at landfall appears to be relatively fast (16 mph), which could extend damage further inland as the storm weakens. These stronger inland winds will likely cause power failures and downed trees over a large area. Wind gusts of 70 mph are likely over southwestern Georgia. Using Verisk Weather Solutions forecasted wind swath allows BMS clients to better understand wind impacts to specific risks. This high-resolution model wind field shows hurricane-force winds rapidly weakening inland due to a frictional effect, which is important when determining the overall damage estimation to inland risks. BMS iVision allows clients to run risks to better understand various impacts from Michael. This is the newest 3 sec wind speed gust in MPH from Verisk Weather Solutions. There will be some adjustment to this forecast over the next few days in both track and intensity. However, this predicted weakening of winds inland does not mean that the winds won’t be strong enough to knock down some trees. As mentioned in yesterday’s update, the tree cover in the Florida Panhandle, particularly from Apalachicola up to Tallahassee, is dense. This is why much weaker Hurricane Hermine caused such extended power outages that lasted weeks in some locations. It does not take a major hurricane to cause significant wind impact in the Florida Panhandle – the peak wind gust reported in Tallahassee from Hurricane Hermine was only 64 mph. Clearly Michael’s degree of disruption will be several times worse in terms of power outages when it comes ashore. With all of the foliage and the lack of major hurricane activity over the last 10 years, a natural culling of weak and damaged trees and branches can be expected. And, of course, even tropical storm-force winds can cause minor damage to structures. This could complicate the overall loss estimate from the modeling companies, although they do try to take into account tree density around individual risks. An often overlooked aspect of a landfalling hurricane is the tornado threat. I made several mentions to this prior to Florence making landfall, which resulted in over 40 confirmed tornadoes. I would also expect several dozen tornadoes to occur with Michael as it comes ashore and races across the southeastern states. Likely one of the biggest stories from Hurricane Michael will be the storm surge. I am sure some storm surge records will be broken. The Florida Panhandle is very susceptible to this, but the extent of the surge will depend on the overall track and intensity of the storm. To illustrate, Dr. Risk Luettich at University of North Carolina Chapel Hill ran a few simulations along the NHC cone of uncertainty which shows that the exact track of Hurricane Michael will determine the storm surge, estimated to be as high as 12 feet if the worst case scenario develops between Indian Pass, FL and Ceder Key, FL. The best tool for estimating storm surge is the NHC storm surge inundation product, which provides a detailed look at the water level that is expected above the ground. The catastrophe models have a good handle on the various storm surge scenarios that are possible based on the track and intensity. Today the catastrophe modeling companies will continue to zero in on stochastic model event selection. Based on the historical catalog, there are plenty of comparable events for the companies to use for loss analysis. As pointed out, there are some unknown variables that are a bit harder to model, such as tree fall and power outages. Florida has some of the best building codes in the country, however the standards in the Panhandle are not as high as southern Florida. This will be key along with the construction quality over more interior parts of the panhandle and Southern Georgia. However, the degree of damage from lower wind speeds is often overlooked for older wood frame building which are common in the region. Just one sample of Probability of Damage from a 2 story wood-frame. Overall, insured loss from wind and storm surge from the historical and modeled stochastic events appear to have a range between $1B and $3.5B. The actual loss will depend highly on the parameters and location of landfall. If the storm tracks to the east side of the NHC cone of uncertainty, which is a rural area, damage should be lower, but tracking too far to the east will increase inland loss in Tallahassee. Twenty-one days ago, I made mention that the Atlantic Hurricane Season was not done yet and, overall, the tropical troubles in the Atlantic Ocean would be shutting down for a few weeks. This has been the case for the most part, with very few of the named storms since Florence resulting in any meaningful ACE (Accumulated Cyclone Energy). Really, named storm Leslie has been the only system to have had any significant ACE accumulate in the North Atlantic. However, all of that is about to change. I previously made mention that the next burst of upward motion would be back over the Atlantic during the first week of October and, like clockwork, on October 2 the National Hurricane Center (NHC) began monitoring a broad area of low pressure that had developed over the southwestern Caribbean Sea. After taking most of last week to get organized, this system is now known as Hurricane Michael and is currently located 50 miles south of the western tip of Cuba. Above is the NHC reasonable arrival of tropical storm force winds as of NHC advisory number 7. Michael has already caused significant flooding across Central America with at least nine fatalities across several countries. Unfortunately, the forecast suggests that more damage is expected over the next few days as Michael moves north over the warm waters of the Western Caribbean. In fact, these warm waters will be key to Michael’s final intensity at landfall as it tracks toward the Big Bend area along the Florida Gulf Coast. Sea surface temperatures (SSTs) are average to slightly below-average, (29°-30° C or 84°-86° F) in the Western Caribbean and Eastern Gulf, but it is still plenty of fuel to feed Michael as it heads northward. 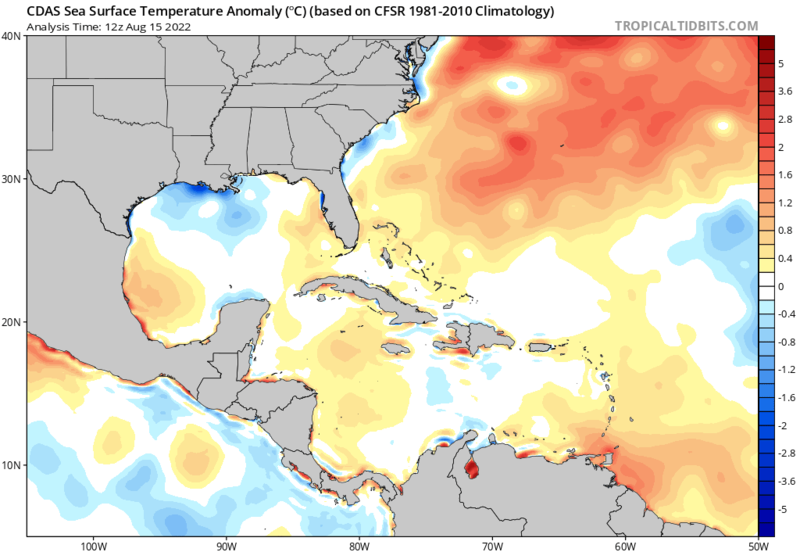 Above is the SST analysis from www.TropicalTidbits.com showing the water temperatures are plenty warm along Michael’s track northward to allow for strengthening. Another factor that might be at play in terms of potential fuel for Michael as it tracks north is how much it will churn up deep, colder water, which might put the brakes on any major rapid intensification. But, when unusually warm ocean waters extend to depths 100 meters or more below the surface, the hurricane’s winds simply stir up more warm water and allow dangerous and rapid intensification to occur if wind shear is low. Michael will be tracking right over the deepest warm water, which is often referred to as the Loop Current — an ocean current that transports warm Caribbean water through the Yucatan Channel between Cuba and Mexico. The current flows northward into the Gulf of Mexico, then loops southeastward just south of the Florida Keys (where it is called the Florida Current), and then goes west of the Bahamas as the Gulf Stream Current. Often, the Loop Current bulges into the northern Gulf of Mexico and sometimes will shed a clockwise rotating ring of warm water that separates from the main current. When this occurs, it can add even more fuel to passing storms. The good news is that it appears Michael will pass to the east of the last Loop Current eddy, which will limit some fuel for Michael as it tracks northward. But, this doesn’t mean that Michael won’t reach Category 3. It just indicates that the top-end intensity will be limited, as was observed with Katrina or even Harvey last year, which was fueled by an old Loop Current eddy. The other factor to consider that may limit intensity is the westerly shear near the storm as it tracks northward toward the Florida Big Bend Gulf Coast. However, despite 30 knots of wind shear, Michael has still managed to strengthen over the last 24 hours and has already had an impressive 982 mb central pressure. If wind shear weakens, Michael could continue to strengthen and potentially make landfall as a weak Category 3 hurricane. Historical hurricane tracks within 65 mile radius centered just south of Tallahassee, FL with a filter applied to show 11 category 2 and 3 hurricanes have made landfall in the area since 1850. The Florida Panhandle has been no stranger to hurricane activity over the last three years. In fact, since 1850, 11 category 2 and 3 hurricanes have made landfall in the location under watch from Michael. The most recent being Hurricane Kate 1985 which today would result in close to one billion of industry loss. Subtropical Storm Alberto and Tropical Storm Gordon have already caused $168M of loss this year to the insurance industry to in the Gulf Coast States. The often forgotten Hurricane Nate in last year’s busy U.S. landfall season impacted the same general area with similar insured loss. In 2016, just over $200M in insured losses resulted from Tropical Storm Colin and Hurricane Hermine, which, as mentioned, might be the best overall analog for the industry at this time. In Florida, Hermine’s impact was enhanced by the natural bend in the coastline and abnormally high tides, with heavy precipitation along the Gulf Coast causing significant damage. In Citrus County, FL, one of the worst affected areas, 2,694 homes were damaged, of which 531 experienced severe damage. If you recall, the Big Bend area has a high tree density which, during Hermine, resulted in large number of power outages that stretched for weeks in locations all the way to the Tallahassee area, which was hit particularly hard with tree fall. Michael’s impacts could be multiplied here since it is expected to be a major hurricane at landfall. The current model guidance suggests a landfall location between Miramar Beach to Apalachicola, FL, with the American GFS model suggesting a faster storm making landfall on Wednesday afternoon, while the European ECMWF model is predicting Thursday morning. However, regardless of timing, the insurance industry impact could be significant. The U.S. coastline between Indian Pass to Crystal River is one of the most vulnerable locations to storm surge. The current forecast suggests up to 11 feet of storm surge in this area, which could go even higher as Michael intensifies so don’t be surprised if values above 11 feet start to show up in the forecast. Unlike Florence, Michael will not linger and will move rapidly to the northeast across Central Georgia and southern South Carolina. There will be a swath of 4-8 inches of heavy rain just along and to the northwest of the center of the storm. With a delayed autumn, all the leaves are still on the trees across a large portion of the southeast, which will exacerbate power outages. The highest wind gusts are expected along the coast from Destin, FL to Tayler and Wakulla counties and, as with Hermine, strong winds will have a big impact all the way into Tallahassee, which has the largest population area of the locations under threat, with the rest of the coastline being fairly rural. Tropical Depression Florence is now transitioning to a non-tropical weather system, but it‘s still dumping rainfall over North Carolina and Virginia. As the historic rains and flooding slowly ease up along the North Carolina coast and the population is gradually let back into their communities, the insurance industry will now begin to get a better sense of the damage. It should be noted, however, that travel in this general area is still very limited, and it could be days before the first notice of loss is provided for some risks. The National Geodetic Survey (NGS) has provided its first post-event aerial imagery, which can be found here. They still have yet to fly over the hardest hit areas, but it’s expected that these images will be added over the coming days. Other high resolution images can be found here. For many, the weekend winds were not the problem as Florence moved slowly across the Carolinas. At this link provides some of the official top wind gusts observed across the multi-state region. The top observed wind speed was 112 mph gust from a Buoy 30 miles south east of Topsail, NC. Onshore the highest wind gust continues to be 105 mph as observed at Wilmington Int’l. Airport. The wind gusts, however, may only be half of the problem as the long duration of strong winds will likely increase insured losses. A low level wind event of long duration can inflict just as much damage as a shorter and stronger wind gust event. Another thing to consider is that many of our building design codes and vulnerabilities built into the catastrophe models are developed around the gust. This will result in a bit of uncertainty around the loss estimates within the catastrophe models. Above is a look at the overall event summary of the wind duration in hours of wind gusts of 50+ mph. This is provided by Verisk Weather Solutions and available in BMS iVision. Unfortunately, the rainfall forecast has played out as expected. Numerous locations in southeastern North Carolina have endured more than 20 inches of rain, with Onslow and Carteret counties being hit particularly hard. At least twelve locations appear to have broken the state record for tropical storm or hurricane rainfall, exceeding the 24.09 inches that fell near Wilmington during Hurricane Floyd in 1999. Here is the selected preliminary storm total rainfall in inches from 2:00 p.m. EDT, Thursday, Sept. 13 to 10:00 a.m. EDT, Monday, Sept. 17. It should be noted that the Elizabethtown, NC total of 35.93 inches is the most for any tropical storm or hurricane along the East Coast north of Florida, and this represents a new 2-day and 3-day rainfall record for North Carolina. However, it does not appear at this time that the 24-hour rainfall record for the state was broken. It’s still likely that higher observation totals could result, as reports are still rolling in. It wouldn’t surprise me to see a total value of around 36 inches eventually being reported. Further south, the town of Loris, SC posted a preliminary total of 23.63 inches, which is a new rainfall record from a tropical system in South Carolina. The river water is starting to recede in some areas, but some areas could see the water level continue to rise as the water moves toward the coast. For example, the Cape Fear River in Fayetteville, NC is already at flood stage and is forecasted to rise to 62.3 feet by Tuesday morning. Water levels along the Lambert River are also expected to rise. River level information can be found at the National Weather Service site here. Some online maps, such as Google Maps, the NC DOT, provide road closure information which helps to illustrate the areas that are experiencing high water. The National Flood Insurance Program (NFIP) will bear the lion’s share of losses, and it’s apparent that a large protection gap exists with the very low NFIP take-up rate that we have previously mentioned. It’s still unclear if this level of flooding will have an impact on the catastrophe bond and reinsurance programs that help the NFIP with recoveries. The various insured loss estimates that have been publicly released from the modeling companies range from $2.5 billion to $5 billion in insured loss. What Tropical Troubles Are Next? I mentioned several times last week that, overall, the tropical troubles in the Atlantic Ocean would be shutting down this week. In fact, today is the first day since August 31 that the Atlantic Basin is not generating ACE (Accumulated Cyclone Energy), which means the basin should have a few quiet weeks ahead. The only area of concern for the insurance industry at this time is the remnants of Isaac, which are located just south of Jamaica. Overall, the chances for formation are very low as the system moves toward the Yucatan Peninsula. Tropical Depression Joyce in the far eastern Atlantic continues to lose organization and should dissipate in a few days. Although the Atlantic will be quiet for the next few weeks, I don’t think the season is done quite yet. A burst of upward motion could come back into the tropical Atlantic during the first week of October. This would correspond climatologically with typical development originating in the western Caribbean Sea this time of year instead of coming off the coast of Africa. The figure above shows the named storm points of tropical cyclone genesis from October 1 – 10 between 1851 – 2015. Focus will now shift closer to the U.S. and western Caribbean. The content below is the same as what was sent in the e-mail. According to the National Hurricane Center, at 7:15 a.m. EDT today, Hurricane Florence made landfall at Wrightsville Beach, NC, just east of Wilmington, NC, the largest city in the area with a population of just over 117,000. Florence came ashore with winds of 90 mph and a central pressure of 958 MB. However, as many in the media have communicated, the storm surge impacts are likely to be similar to a major hurricane at landfall. Many areas along the coastline have experienced tropical storm-force winds for over 24 hours now, and by the time Florence moves inland, some areas will have had well over 24 hours of hurricane-force winds. There are numerous reports of wind gusts over 80 mph and a handful over 90 mph. The highest wind gust I have seen reported is 105 mph at the Wilmington, NC airport, which is the second-strongest wind measured at that location in 60 years. The strongest ever recorded was 135 mph during Hurricane Helene in 1958. It should be noted that there could be even higher wind gusts, as all observations at this point are preliminary. Below is the BMS iVision wind swath provided by Verisk Weather Solutions, which shows the extent of the three-second wind gusts along the coast and how far inland hurricane-force gusts could be observed. BMS iVision additionally has other severe storm attributes, such as rainfall and wind duration over 50 mph. At this point, according to poweroutage.us, there are approximately 575,00 power outages reported across North Carolina and South Carolina with the number growing each hour. So far, the Storm Prediction Center has only received one report of a tornado. However, as Florence tracks inland, it is expected that tornadoes will become increasingly likely today in the northeastern part of the hurricane. A tornado watch remains in effect for portions of eastern North Carolina. Storm surge was expected to be a major problem along coastal areas, as Florence’s slow motion and overall large size allowed for the constant piling up of water along coastal and inland waterways. Although observations of storm surge are preliminary, reports of six feet have been observed in New Bern, NC, which is 30 miles inland along the Neuse River. If the observations are correct, this is approximately two feet higher than the observation during Hurricane Irene in 2011, according to the National Weather Service in Morehead City. Observations of storm surge along the coastal section could be higher, as observations are limited at this time. However, since the worst of Florence came ashore as the overnight high tide was receding, overall maximum water heights may have been reduced. The rainfall story continues to evolve with the highest observation coming from Atlantic Beach, NC, where 30.68 inches of rain have been witnessed over the last 24 hours. If validated, this would wipe out the previous state 24-hour rainfall record. However, some reports suggest this reading could be in error. There have been other reports of 12-18 inches in the last 24 hours, and this will undoubtedly create localized flooding issues. Since the storm just made landfall, expect much higher amounts by the time Florence finally moves inland, which might not be until Sunday morning. Overall damage seems to be aligned with the wind speeds that have occurred, such as the occasional gas station awning being damaged, and siding and asphalt shingles being torn off residential structures. The damage could be higher than normal due to the long duration of hurricane-force winds. Along the coastal barrier islands, many structures have first floor flooding. But, keep in mind, many of the coastal structures are designed to flood and are typically only temporary living spaces or used for storage. Thankfully, the overall insured loss estimates are many times less than what was predicted earlier this week. Only a few catastrophe modeling companies have publicly provided loss estimates at this time, which range from $2B to $5B for wind and surge. It should be noted, however, that any loss estimates provided are preliminary, and the insurance industry is accustomed to loss estimates creeping up over time. Florence will slowly track westward into eastern Tennessee by Sunday night. By Monday morning, Florence is expected to be caught up in a trough of low pressure and should quickly move across the Northeast states during the middle of next week, resulting in a swath of 2 to 4 inches of rain along the Appalachian Mountains. Isaac is currently a tropical depression and will likely be reclassified as an open wave. Currently, there is a 25% probability that Isaac comes back to life over Cuba, and if this occurs, it could have an influence on Florida or the Gulf Coast states later next week. Overall, there has been a fair amount of activity lately. Keep in mind, however, that we are still four days from the actual peak of the hurricane season. It is all downhill from here. As I mentioned at the start of the week, the tropical Atlantic should begin to shut down any new activity in the coming days, but any activity that has already developed will need to be watched closely. The next expected uptick in activity should be the first or second week of October. After tracking over 3,292 miles across the Atlantic Ocean, Florence will become one of only two hurricanes to make U.S. landfall from its origination point off the coast of Africa since 1851. It also becomes the only hurricane since 1851 to make landfall from its location that was observed in the middle of the Atlantic Ocean back on September 6th. For the last 2-3 days, the landfall target has been focused on an area between Myrtle Beach, NC and Morehead City, NC, with the primary area of impact being just north of Wilmington, NC in New Hanover, Pender and Onslow counties. With Florence’s center core finally showing up in the long range radar, it would appear the end game is finally near. The biggest change in the forecast since the start of the week has been the change in intensity, which is a known issue in hurricane forecasting. There has been some general improvement in skill over the last decade, but more recently over the last five years, intensity forecasting has been challenging. As Florence begins to move over the warm waters of the Gulf Stream, will it regain strength? This is unlikely, as the core of the hurricane is finally falling apart due to multiple eyewall replacement cycles, along with dry air and wind shear that have been finishing the job over the last 24 hours. However, because Florence is moving over the warm waters of the Gulf Stream and wind shear is a bit more relaxed, it’s likely that only gradual weakening will occur until its landfall around 3:00 a.m. EDT tomorrow. Shortly after this expected landfall, a more rapid pace of weakening is expected as the center of the storm moves inland into central South Carolina. Hurricane Ike made landfall on the Texas coast 10 years ago this morning. It was only a strong Category 2 hurricane at landfall, but don’t make the same mistake by judging Florence as only a Category 2 hurricane, as disastrous rainfall flooding and storm surge impacts are likely to occur. Based on the NHC storm surge inundation forecast, the storm surge is expected to be between 9 and 13 feet from Cape Fear to Cape Lookout, NC, where the natural concave shape of the coastline will enhance the surge. It appears that the surge will come ashore just after high tide tomorrow, which occurs around 11:30 p.m. tonight with low tide occurring at 5:00 a.m. tomorrow. A great resource to use to understand storm surge risk is the very detailed NHC Storm Surge Inundation maps. Disastrous flooding is expected over wide areas, with the heaviest rainfall amounts coming near the coastal Carolinas. The Central Appalachians could also experience heavy rain over mountainous terrain, and orographic lifting rain will likely trigger mud and rockslides. It still appears likely that the North Carolina state record for rainfall from a named storm – 24.06 inches from Hurricane Floyd in 1999 – will be broken, but it’s unlikely that the greatest 24-hour rainfall record of 22.22 inches will be broken. Because Florence will slow its forward motion after landfall, the large amount of rainfall is a big concern as it all flows to the Atlantic Ocean. The constant onshore flow over the next two days could back up some of the water trying to escape from the inland tributaries. The National Flood Insurance Plan (NFIP) Take-Up Rate in the Carolinas as a percentage of county housing units is less than 1% for many inland counties, with much of the NFIP risk located at the coastal counties. Even the take-up rates in the highest storm surge impact counties of New Hanover, Pender and Onslow counties is relatively low , illustrating the large protection gap that exists across the Carolinas. Tropical storm-force winds (39-plus mph) are expected to arrive in the hurricane warning area by early this afternoon. Hurricane-force winds (74-plus mph) may arrive by this evening. Even though Florence is expected to be much weaker than initially thought, it does not mean that wind damage won’t occur. Numerous downed trees and long-lasting power outages could occur near where Florence’s center strikes and even further inland. Both Hurricane Ike 2008 and Hurricane Sandy 2012 were large hurricanes in size and had a wide range of impacts. Another thing to watch with Florence is the relatively slower movement once it makes landfall. Hurricane damage is often associated with peak wind speed. However, an AIR-Worldwide Blog by Dr. Vineet Jain in 2010 suggests that claims data and post-disaster survey findings repeatedly and consistently show that the amount of damage a structure experiences is also a result of wind duration—how long a hurricane’s winds batter a structure. In the end, neither peak wind speed nor wind duration are a favorable scenario for a structure’s ability to endure damage above various design code levels. The cumulative stress load variations from long term exposure to hurricane winds can increase the overall damage potential to a structure beyond just the peak gust endured at a location. However, keep in mind that Category 2 Hurricane Arthur that hit the Outer Banks in 2014 did not register as a Property Claim Services catastrophe event, illustrating how building codes are working and how resilient structures are becoming along the coastline of North Carolina. BMS iVision allows clients to run risks to better understand various impacts from Florence. This is the newest 3 sec wind speed gust in MPH from Verisk Weather Solutions. Notice the expanding wind swath with the 90 mph wind gust swath extending out 60 miles from the center of the storm. Yesterday I bought up the risk of tornadoes from landfalling named storms. After doing a bit more research, it seems that the tornado threat from Florence in the Carolinas might be higher than we’re normally accustomed to seeing with landfalling named storms. Florence’s larger and more intense wind field increases low-level shear over a larger area, favoring more tornadoes. See McCaul (1991). Clearly this could add another element to the landfall threat associated with Hurricane Florence and tornado watches are posted. Given the potential amount of rainfall and tropical storm force-winds that could reach areas well inland, the insurance industry should expect high amounts of tree fall that will produce power outages. The Guikema Research Group at the University of Michigan has now produced power outage maps. As the storm makes landfall, www.poweroutage.us will be a good resource for real-time power outages. Keep eyes on Isaac which will likely be reclassified as an open wave, but some models still bring it into the Gulf of Mexico later next week as a named storm. Overall there has been a fair amount of activity lately, but keep in mind that we are two days off the peak of the hurricane season and it is all downhill from here. As I mentioned at the start of the week, the tropical Atlantic should begin to shut down any new activity in the coming days, but any activity that has already developed will still need to be watched closely. The next expected uptick in activity should be the first or second week of October. Why is Florence Stalling and moving South? The recent development of Florence stalling at landfall versus inland is a pretty big change in terms of the overall impact to the insurance industry and, frankly, I think the NHC best summed it up in their 5:00 p.m. forecast discussion Number 50 yesterday. The steering currents have collapsed and could exacerbate any and all effects along hundreds of miles of coastline. This is not something the insurance industry wants to hear. It seems counterintuitive, and it is an unusual scenario. Florence will have nowhere else to go but south or along the coastline into South Carolina this weekend. The best technical description might be from Doug Simonian, a meteorologist at www.nymetroweather.com. So, what does this all mean? The 500mb layer, which is roughly 18,000 feet in altitude and known as our midlayer, is often used to look for steering currents that drive hurricane direction. This has bridged the steering currents to the north, which means Florence has nowhere to go but stall or move southwest. In the short term, it still seems like it is certain that Florence will touch the North Carolina coast near Cape Fear, NC and then drop south. After 72 hours, however, it’s anyone’s guess as to what direction Florence will go, which is why the NHC cone of uncertainty continues to balloon along the coastline. The Good: Based on this forecasted track change, the overall inland impact from heavy rains and tropical storm-force winds has diminished greatly for North Carolina. Another potential outcome is that as the storm slows towards the coastline it will create upwelling, causing the storm to weaken and, therefore, unlikely to stay a major hurricane any time after Friday morning when it is near the North Carolina coastline. However, if Florence can stay over water, it will maintain its hurricane structure and could still be at Category 1 or 2 hurricane strength for another day or so. If it moves inland, expect Florence to quickly be downgraded to a tropical storm. Finally, another positive note of a slower moving storm towards landfall or along the coastline is that it would likely draw in dry continental air, thus weakening the storm as it stalls. There are still signs that stronger wind shear will also help weaken the storm as it nears the coastline. The Bad: The overall winds will still be strong right along the coastline near southern North Carolina and, if the storm tracks along the coastline, it would just put that much more property exposure at risk to hurricane-force winds. The fact that hour upon hours of hurricane force winds could occur can be just as destructive as a short period of higher wind speeds. This also shifts the heaviest rain and flooding along the entire coastline, and major flooding is still expected along the coastal inland areas, with heavier rains now forecasted over South Carolina and maybe even into Georgia. The insurance industry is well aware of the exponential growth that has occurred along the coastal areas of the U.S. The graphic below illustrates the population growth between Myrtle Beach, SC and Wilmington, NC in 1940, 1990 and 2018. This rapid increase in the coastal population will increase potential insured losses from both wind and storm surge if Florence decides to track along the South Carolina coastline this weekend versus moving inland as a weaker tropical storm. It should be noted that a large portion of the population in this region has not experienced a hurricane of this magnitude since Hugo in 1989, and very few likely lived in the area during Hazel in 1954, the most recent Category 4 hurricane to impact the region. Thankfully, these analogs are no longer relevant to Florence’s forecast. BMS iVision allows clients to run risks to better understand various impacts from Florence. This is the newest 3 sec wind speed gust in MPH from Verisk Weather Solutions. Notice the expanding swath of high winds along the South Carolina coastline. There are known impacts of storm surge which are well modeled in the NHC Potential Storm Surge Flooding Maps, the best resource at this time. There is really no good news in this scenario, and the scenarios only get worse. Initially, the storm surge scenario still plays out with the concave shape of the North Carolina coast being a significant contributor to storm surge, which allows water to pool while being directed inland. Therefore, at this time, the worst of the storm surge will likely occur along the southern South Carolina coastline. If Florence stays along the coast, it means hours of onshore winds over multiple tide cycles creating even bigger problems, and if the storm moves down along the South Carolina coast, it will see some even higher water heights. But, the storm surge impacts are highly dependent on the final track. To better understand the impacts upwelling might have on Florence’s intensity as it stalls near the coastline, data from Air Launched Autonomous Micro Observer (ALAMO) can be used. These floats are launched out ahead of the storm by hurricane hunters to get observation of the thermal energy in the ocean, which is a prime driver for hurricane strength. As the hurricane passes, the data is collected in real time. Last night, Florence went right over ALAMO floater #9136, which showed substantial vertical mixing of the water column with the water going from 29 degree c to 27.5 degree c. It is this same vertical mixing that will likely weaken Florence along the coastline. There has been very little discussion around the tornado risk from a landfalling hurricane. Currently, the Storm Prediction Center is not indicating any increase in tornado potential. Just last year, five named storms were responsible for 119 reported tornadoes across the U.S. Hurricane Harvey had the largest number of tornado reports with 57, mostly clustered near the southeastern Texas coast as it stalled out. This could potentially happen as Florence stalls near the coastline over the next few days. Given the change in forecast, any initial loss guidance has to be thrown out and new events need to be pulled as Florence will likely be a weaker storm. With the forecasted movement along the coastline, it will be challenging to find a scenario that would match a stochastic event out of catastrophe models. There might be events that moved slowly along the coastline in a northeast direction or even stalled like Hurricane Diana in 1984. However, those types of storms are entirely different than a storm that stalls and moves to the southwest along the coastline leaving the strongest winds along the coast versus the weaker winds, which would typically be observed in a northeast moving hurricane. A sneaky tropical storm is likely to be spinning up right before landfall near the southern Texas coastline. This Texas threat is not being well advised at this point, as all eyes are now on Florence. The NHC currently gives this tropical wave a 60% chance for genesis over the next 5 days. Its name would be Joyce if development does occur. At this time, I don’t expect it to become a hurricane prior to landfall, and it should mostly just be a rain event for coastal Texas. However, it’s important to watch. Now Tropical Storm Isaac, which is currently a tropical storm 450 miles from Martinique, also needs to be watched. Although the NHC does not currently have this as a hurricane, some models are suggesting that Isaac could become a hurricane over the Caribbean. These models also show a risk for it to track into the Gulf of Mexico. This is something to watch moving forward and will depend on Florence’s final movements. Although yesterday I mentioned that Florence is not just a point on a map and will have a wide-ranging impact far away from the center the storm, the center does still matter. With Florence about 72 hours away from its expected landfall around 7:00 a.m. AST on Friday, there is still some uncertainty regarding the exact landfall location. Florence continues to fluctuate in intensity with winds of 130 mph, along with stronger gusts. The diameter of the most destructive winds, known as the radius of maximum winds, is currently only 10 miles, but will likely continue to grow. The plot below is from our BMS iVision application with the Verisk Weather Solutions wind one minute sustained swath. This is only one possible forecast scenario, but it provides an idea of what the wind field could be. This will shift north or south based on the eventual track, with the strongest winds likely being on the right side of the track. If these maximum winds occur over a more populated area, the damage will be much greater. For example, the losses from last year could’ve been a different story if the strongest winds from Hurricanes Harvey and Irma hadn’t just missed the populated areas of Corpus Christi, TX, and Miami, FL, respectively. At this point, the forecast still holds that Florence will make landfall between Myrtle Beach and Morehead City, NC as a strong Category 3 hurricane with winds of 120 mph. BMS iVision allows clients to run risks to better understand various impacts from Florence. This is the one minute sustained wind in MPH from Verisk Weather Solutions, which shows only a very narrow band (33 miles) of damaging wind speeds. Several hurricane intensity models suggest Florence is still expected to maintain at least Category 4 hurricane status for the next three days as it heads toward the North Carolina coastline. The map is from weathermodels.com and Ryan Maue shows there is plenty of ocean heat content. If Florence comes ashore with winds of 140 mph as previously forecasted by the NHC, this would be above the International Building Code standards, which are the strictest right along the coast. However, hurricane-force winds will likely extend up to 30-60 miles inland, with tropical storm-force winds extending even further. These wind gusts will be strong enough to cause power failures as far north as Virginia and, given that it has been decades since a major wind event has impacted this area, it’s likely that a lot of old, damaged and diseased trees will be cleaned up. These strong winds, combined with the wet soil conditions over the last month, may lead to a high likelihood of wind-related treefall damage. It appears that the forecasted track for the center of the storm and the NHC cone of uncertainty are getting closer together. The primary reason for the slow movement after landfall is a strong blocking ridge of high pressure to the north. This will cause Florence to potentially behave erratically this weekend, similar to what happened with Hurricane Diana off the Southeast coastline in 1984. The major issue with stalling is that a large amount of rain is forecasted to fall. The spread in model rainfall forecasts has increased since yesterday. It is likely that a maximum of 20 inches could fall, but this all depends on how long Florence stalls and what type of orographic influences occur in the more complex terrain further inland. The North Carolina state record of rainfall from a named storm is 24.06 inches from Hurricane Floyd in 1999. Because of the wetter-than-average conditions recently, dams may not be able to contain the rainfall and areas that have never flooded before will likely flood. Unfortunately, in October 2016, Hurricane Matthew brought heavy rainfall and flooding to North Carolina. The story is the same after every major flood event – many of those affected were without flood insurance. North Carolina is a leader in floodplain mapping and risk communication, and the recent major flooding from Hurricane Matthew provided a reason for consumers to get flood protection. According to the following data, nearly 300 North Carolina towns, cities, and counties increased the number of NFIP policyholders since 2016. Seventy remained steady, and 130 saw decreased participation. Not surprisingly, coastal communities are the biggest participants in NFIP. Most notably, Fayetteville had a whopping 65% increase in the number of policies, albeit only to 1,290 (the 2010 Census documented 87,000 housing units in the city), which still shows a very large protection gap. Other large cities saw increases, including 10%+ increases in Charlotte, Durham, Raleigh, and Greensboro. If there is any good news here, it’s that more flood coverage has been provided and NFIP has reinsurance to aid in its expected losses. However, large protection gaps still remain. The NHC has started to issue watches and warnings this morning, and with that they have issued the first storm surge watch for Florence. The combination of a dangerous storm surge and the tide will cause normally dry areas near the coast to become flooded. Surge-related flooding depends on the relative timing of the surge and the tidal cycle, which can vary greatly over short distances. The NHC has now started to issue storm surge inundation maps and they should be watched closely. It’s likely that the current inundation levels of greater than nine feet above ground will likely grow. There are several reasons why the insurance industry needs to understand the potential loss from Florence. Insurance companies are looking to understand the size of loss relative to their reinsurance placement. They also might be looking to buy top-up covers or 3rd or 4th event covers, if needed. There is also the need to understand where to stage claim adjusters or if third-party adjusters might be needed. The reinsurance industry is keen on triggers of ILW, Cat Bonds and retro needs. There is also an active LiveCAT market for the industry to buy or sell extra capacity. With the understanding that some catastrophe modeling companies usually don’t issue insurance industry loss guidance until about 48 hours before landfall, curiosity often takes people to GIS and the various stochastic track sets to see what potential losses might be. However, Florence’s expected stalling makes event loss selection more challenging, as many of these stochastic track events often move into the Northeast as climatology would suggest. Therefore, only losses from the Southeast should be used to limit losses that might occur from events that track further inland up into the Northeast. Also, given the general cone of uncertainty 85 hours before landfall, the loss ranges can be quite large. This is primarily driven by events that track over more urban coastal areas versus those that track over less populated areas. There are clearly some large loss scenarios with events that could hit Myrtle Beach, SC, and Wilmington, NC, which could easily reach into the billion dollar range. The most extreme loss scenarios at this time are from Charleston, SC, which is slowly becoming an unlikely scenario. Simple exercise of narrowing down a stochastic track sent from a catastrophe modeling vendor. The events here are based on the model range of landfall, by looking at different storm variables at the time of expected landfall. The light blue tracks are tracks that are not as realistic due to the recurving of the storm after landfall. Meteorologists hate being wrong, but with the magnitude of potential disaster that is ahead for the insurance industry this week, I hope I am. I have been working in the insurance industry for the relatively short period of 16 years, but I have also spent a lot of time researching the historical impact of past hurricanes on today’s exposure. I am concerned that what may occur later this week will likely be talked about for decades to come. We are now past the point of having to focus on which model is performing best, as the majority of the model guidance is in agreement. It is now time to focus on the fact that Florence is going to make landfall, but the main forecast question now is what will Florence do as it nears the coastline? A blocking high pressure ridge is expected to slow Florence down or potentially even stall the storm. A stalled storm will bring a prolonged period of additional heavy rain (think Hurricane Harvey last year). Although there will likely be some track shift on the exact location of the strongest winds at landfall, which is a very important detail for estimating insured losses, this detail won’t be known for another 48 hours or more. The overall intensity of the storm will likely influence the final track, and the intensity forecast is just now starting to play out. The loss potential is much smaller if the strongest winds are focused south of Myrtle Beach over the Tom Yawkee Wildlife area than if the strongest winds occurred over Myrtle Beach, SC, Charleston, SC or Wilmington, NC. After weakening from its Category 4 start last week, Florence is now undergoing rapid intensification, with many of the intensity forecasts showing a range between Category 3 to Category 5 over the next four-day forecast period prior to a potential landfall. This is all driven by an environment of low wind shear and significant upper-level outflow, which are perfect conditions for building intensity in a named storm. If you add in the fact that Florence will be moving over the very warm waters of the Gulf Stream, which are already as much as six degrees warmer than average, there should be no reason why Florence wouldn’t maintain major hurricane status until landfall. A Category 5 hurricane is becoming likely at some point in the next few days. The only formalities will be internal eyewall replacement that will allow for small fluctuations in strength, but it’s a double-edged sword: a slightly lower wind speed will probably mean a larger sized storm. Another thing to watch before landfall is an increase in wind shear. Some models are showing this, which would help weaken Florence slightly before its potential landfall. This is something that will be well known in the next day or two, with Florence still likely to be a large damaging hurricane at landfall. NHC Hurricane Florence Wind Speed Probabilities of at least tropical storm force. More details here. It is too early to provide wind swath estimates, but the ensemble of tracks provide an idea of landfall location with the strongest winds to the right of the storm’s track. Should some of the intensity forecasts become verified, a Category 4 storm impacting the coastline of the Carolinas would be dangerous and problematic. Although the NHC hasn’t yet begun to issue official surge forecasts, overall the Carolinas’ coastline is particularly vulnerable because of low lying barrier islands, inland waterways and bays that can amplify surge. Because there is uncertainty in the track, the best tool to use right now is the NHC’s Maximum Of Maximum (MOM) storm surge layer, which is an attempt to quantify the potential impacts of storms of different strengths at different angles. This is done by running an ensemble of simulated Category 4 landfall scenarios for a region to get an idea of the maximum storm surge that can occur over various sections of the coastline. It should be noted that this is not a Florence forecast. I expect the NHC to begin issuing better storm surge guidance on Florence by tomorrow. A Category 4 storm making landfall from the southeast along the South Carolina/North Carolina border could bring surges in excess of nine feet to coastal regions. These layers are in BMS iVision for clients to get a better understanding of maximum impact. The force of water can’t be underestimated and, depending on track, waves as high as 15 feet are expected to crash along the coastline and add to the storm surge impact. The right side of the storm will feature the largest storm surge and highest waves, which puts the area north of Cape Fear at highest risk, with a general predicted surge plus tide of 12-15 ft above mean sea level and 9-12 ft above high tide. Unlike Harvey (in flat terrain), Florence is coming onshore to hilly and mountainous terrain. This will magnify rainfall from orographic lift and runoff will channel into devastating flash/riverine flooding as well as liquefy mountain slopes. The amount of rain will surely impact infrastructure. We have seen time and time again from past flooding events that 10-15 inches of rain over two days is beyond the design capacity of most storm water infrastructure, which creates even more problems beyond flooding on roadways, rivers, creeks and streams. Based on the government’s quantitative rainfall forecast product, the maximum amount of rainfall that is forecast is more than 15 inches! What makes this even worse is that more rain than usual has fallen during the last 30 days over most of the area where Florence’s heaviest rains are forecast to fall. The number of inches of rain above (green/purple) or below (reds/yellows) normal over the last 30 days. In much of western Virginia, Maryland and eastern West Virginia, it has been wetter than normal. • Run off more quickly than usual into rivers that are already higher than usual. • Weaken the soil which could increase tree fall and increase insured loss. Keep in mind that the models do not do a great job with forecasting rainfall over more complex terrain. In fact, total rainfall forecasts are difficult, period. As an example, days before Hurricane Harvey’s torrential rain began in Houston, the maximum amount forecasted for the region was 29 inches. However, the heaviest actual amount was 60.58 inches! I expect many rainfall and river level records for the area to be broken, including many set from 1973’s Hurricane Agnes, which caused record flooding in the Mid-Atlantic region with less than 15 inches of rain over Virginia and West Virginia. Again, let’s hope that the government meteorologists are wrong with the forecasted rainfall amount of 15 inches from Florence. NOAA rainfall forecast for Florence with up to 15 inches of rain forecasted over the next 7 days. Also, watch the tropical system along the Texas coastline as a rain maker. A quick reference for potential flooding might be the FM Global Flood mapping tool, which allows users to understand areas that are prone to flooding in great detail. Another resource might be the real-time flood network for NC. Given the potential amount of rainfall and hurricane-force winds reaching areas well inland, the insurance industry should expect high amounts of tree fall that will produce power outages. In the past, the Guikema Research Group at the University of Michigan has produced power outage maps. I contacted them and they will be running their model today, but www.poweroutage.us will be the source to watch as Florence makes landfall. The importance of strong, well-enforced building codes was clearly demonstrated with the hurricanes of 2017. The Insurance Institute for Business and Home Safety (IBHS) provides technical guidance to inform and improve model building codes, advocates for timely adoption of national model building codes and standards, and encourages uniform enforcement of these codes. In its “Rating the States” report, South Carolina scored among the highest states in the country and North Carolina was just slightly lower. However, as we saw with Hurricane Irma and Florida, (one of the highest scored states in the country), building codes are important to limit damage but are a minimum requirement. The expected winds from Florence will likely be at or above the codes that are enforced. The catastrophe modeling companies won’t be issuing any stochastic model guidance until roughly 48 hours before landfall so, currently, the best loss analysis would involve one’s own event selection or historical loss simulations. The range in historical loss simulation is quite large due to individual storm tracks relative to the exposed areas, which will ultimately influence Florence’s loss as well. On the higher end of the loss scenarios are Hugo 1989 and Hazel 1954, which each surpass $20B of insured losses for wind and storm surge. Other scenarios are below this $20B of insured loss, but with lower intensity and landfall with the highest winds impacting less populated regions. It should be noted that none of the historical storms stalled like Florence is expected to do and do not account for flood related losses. The forecasted impact to the insurance industry will continue to be refined over the next few days, and those details will be shared in future BMS Tropical Updates. While U.S. interests are focused on Hurricane Florence, Hawaii is under threat from Hurricane Olivia. Hurricane Isaac is intensifying further south, with impacts to the Lesser Antilles by late in the week as a weak hurricane. Hurricane Helene is also in the Main Development Region and will likely recurve later this week. Another area to watch later this week is a tropical system that may move up into the Texas coastline. There is a chance that we could have as many as five simultaneous Atlantic named storms this week. The record for active simultaneous Atlantic named storms is four, which was set several times, and the record for named storms including tropical depressions is six, set in September of 1971. Hopefully, we won’t see that occur, since the Basin is now starting to shut down any new development for the next several weeks.